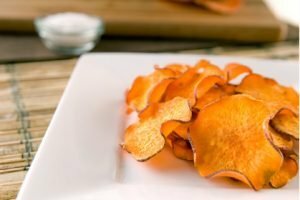 Can diabetics enjoy sweet potatoes? Absolutely! There is a great deal of confusion about whether or not people with diabetes can include sweet potatoes in their diet. Before including any foods in your diabetic eating plan, consult your healthcare professional. The good news is sweet potatoes can be enjoyed as part of an overall healthy diet rich in fruits and vegetables, because they are high in fiber and contain beneficial vitamins and minerals such as vitamins A and C, potassium and manganese. A diet rich in potassium helps offset some of the harmful effects of sodium on blood pressure. Plus, sweet potatoes contain virtually no fat and are low in calories. A medium baked sweet potato eaten with the skin is a mere 103 calories, about the same as half a cup of brown rice. And there might be even more reason for diabetics to include sweet potatoes in their eating plans. 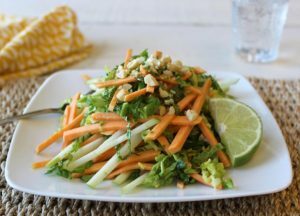 Research has found that these root veggies may play a role in stabilizing or lowering blood sugar, due to their low glycemic index. Foods low on the glycemic index break down more slowly in the body, which may produce fewer fluctuations in blood glucose and insulin levels. For a low-to-medium glycemic index, eat sweet potatoes cooked with the skins on or raw, such as in a slaw. When eating sweet potatoes without the skins, know that they fall into the medium glycemic zone, between 63 and 66, which is still lower than other starchy foods such as instant mashed potatoes and even whole-wheat bread. If you’d like to download or print this information, please click here for a downloadable “Sweet Potatoes + Diabetes” resource.